Mechanical Slit Seeding is a method of thickening a lawn that has become thin or damaged by insects, diseases, weeds, drought, excessive traffic or other types of damage. For these problems we recommend this seeding service. This is a mechanical seeding process of applying seed directly in contact with the soil of an established lawn. It is accomplished by dropping seed into the slits created by a slit seeding machine. The blades are designed to slice into the lawn with minimal damage except for some existing thatch being pulled up. Slit seeding is also a great way to introduce new cultivars of rye and fescue grass with endophytes properties to combat the damage caused by leaf-feeding insects. Endophytes are fungi that are scientifically engineered to grow inside the grass plant and taste bad to the insects. The type of insects repelled by endophytes are typically hairy chinch bugs, bluegrass billbugs and sod webworms. Lawn species that may contain endophytes are perennial ryegrass, fine fescues and tall fescue. We use brand name cultivars of certified seed for our slit seeding service. Certified seed ensures our product contains 99.9% weed free seed. ! 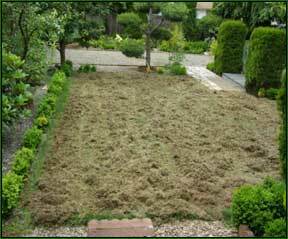 Overseeding service is ordered separately as a individual service. Dethatching and power raking is the process of removing the layer of organic matter made up of decaying grass leaves, stems and roots that build up in between the lawn and soil surface. It is a common problem on Kentucky bluegrass lawns that have been established for several years which have been over-watered and over-fertilized. Thatch harbours insects such as chinch bug and promotes diseases. 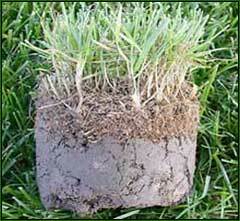 Thatch can restrict grass roots from growing deep into the soil resulting in a shallow rooted lawn. Thatch also interferes with water infiltration and nutrient uptake in the root zone. Cutting your grass blade only 1/3 at a time to allow easy decomposition of clippings that remain on the lawn. Increase microbial activity by adding amendments to break down organic matter. A thatch laden lawn feels very spongy when walked on. To determined whether you have a thatch problem cut a triangular patch of lawn with a sharp knife and lift it. The cross section should reveal less than 1/2 inch of thatch. More than that amount suggests you have a thatch build up. This example demonstrates a lawn core containing excessive thatch well in excess of ½ inch or 1.3cm . Dethatching is necessary at this point in addition to a core aeration to reduce soil compaction and to allow the roots to grow deeper into the soil. This image demonstrates a lawn containing excessive thatch that has been power raked and dethatched. The thatch has been pulled up above the grass and now needs to be collected and removed.